Japanese food and language were all I knew until age 5 (although I’m an American of European descent.) Tokyo was my hometown until age 18. Japan is famous for its Kobe beef. However, my first bite of beef was at my grandmother’s house in Colorado. I was sent there one summer to learn English. Good thing my Nona was patient…And had a large stash of nori. (Dried Japanese seaweed) I refused to eat meat if not wrapped in nori. 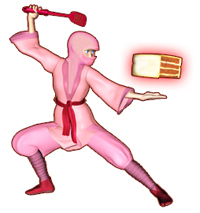 Besides being the best grandmother ever, Nona was an excellent cook. So the beef (wrapped in nori) was swallowed without complaint. On subsequent summer visits to Nona’s house, I was not quite as demanding. Also, I did learn English. Thanks to my grandmother and my cousins. Some of them managed corn and green bean farms. On drives to the farms - or even to the market - I saw grazing cattle. It was quite a contrast to my “regular” life in cosmopolitan Tokyo. But a welcome change. Colorado summers were opportunities to learn about family, horseback riding, S’Mores and how to enjoy American beef! Recently, I was introduced to Certified Angus Beef® brand beef. The beef is delicious. It didn’t need nori. But I’m feeling nostalgic about my Nona…I miss her. I wish I could have thanked her out loud for all her love. 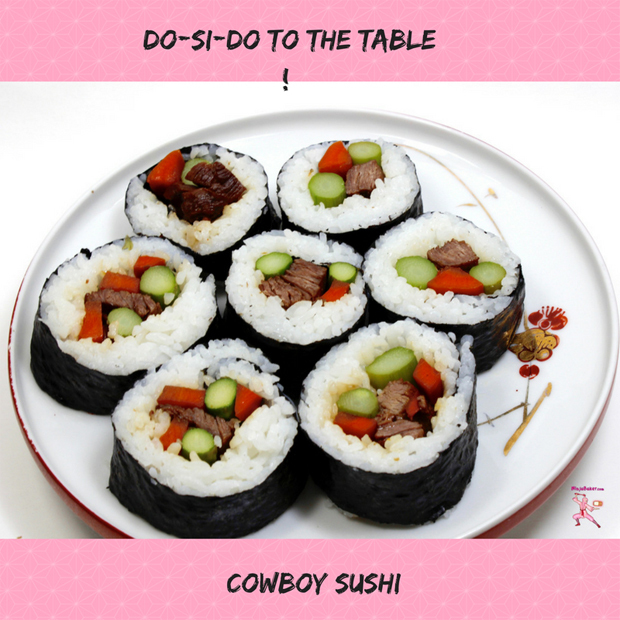 So, for today’s Sunday Supper I’m serving up Cowboy Sushi. Quite sure Nona would approve. The tender beef spiked with Japanese sake on top of sticky white sushi rice (wrapped in nori) is scrumptious. 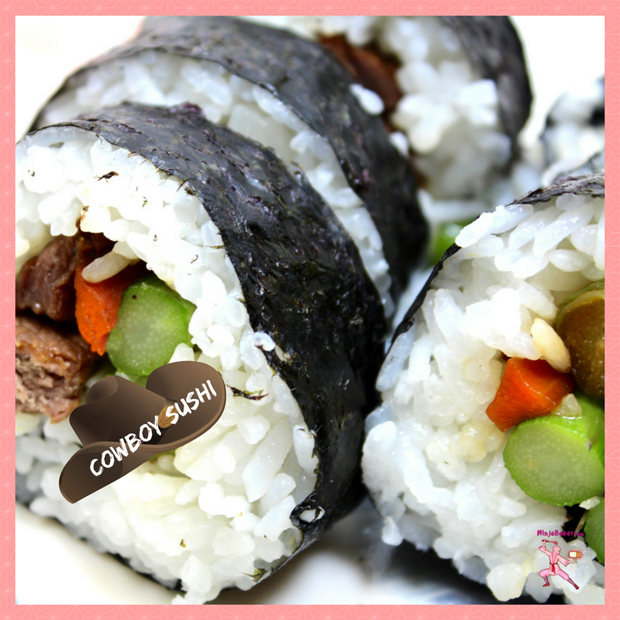 Cowboy sushi makes this Ninja Baker want to put on her cowboy boots and go dancing! Microwave the vinegar with the sugar and salt for about a minute. (Or until the sugar has melted.) 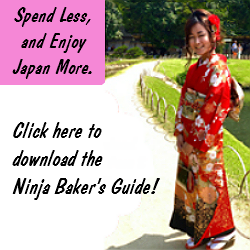 Using slicing motions gently cut the warm vinegar into the hot Japanese (short-grain) rice. Arrange about ¾ cup of cooked Japanese rice on a mat. 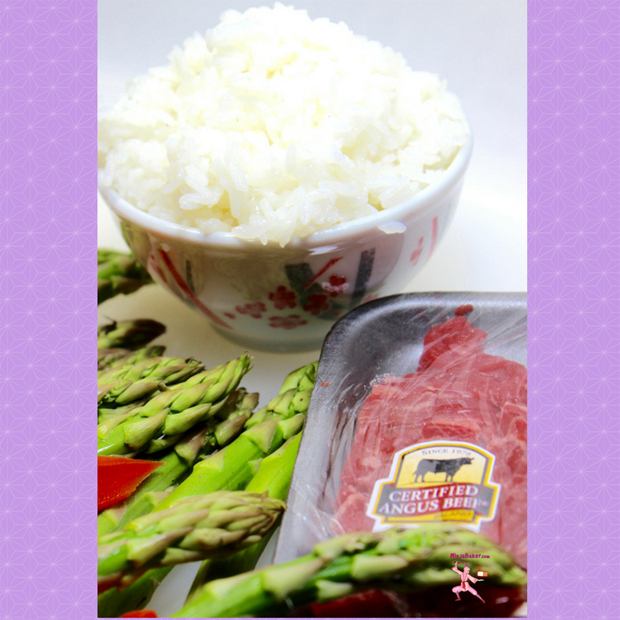 Place a few strips of beef, carrots and asparagus towards the end of the mat. Roll. For pictorial and further instructions please see my recipe for Korean Bee-Bim-Bop Sushi. Cindy of Cindy's Recipes and Writings hosts today's delicious cowboy dance of dishes starring the Certified Angus Beef® brand.